On Feb. 15, Mark Wolynn, director of the Family Constellation Institute, spoke to an audience of almost 1,000 people at Congregation Beth Israel on the topic Understanding Intergenerational Trauma: How Inherited Family Trauma Shapes Who We Are and How to End the Cycle. The crowd sat in rapt silence as he unfolded his own story and the stories of some of the people his therapeutic approach has helped. Plagued by grey blotches and blurs distorting his vision, Wolynn said he was terrified. He tried a litany of alternative medical cures, which didn’t help, and headed off on a quest for enlightenment. After marathon meditation sessions and audiences with several gurus, Wolynn said he waited for hours for a satsang (sacred meeting) with a swami in Indonesia. When he finally made it to the front of the line, the guru looked at him for a moment and said, “Go home and make peace with your parents.” It wasn’t until he heard the same message from the next guru he visited that Wolynn returned home to begin his journey into healing his relationships with his family. Years later, after making both personal and scientific study of the impact of family dynamics and inherited trauma (and healing his blindness), Wolynn has emerged with a persuasive vision of the role that unaddressed trauma can have in our lives – even if the trauma happened in previous generations, and even if you didn’t know about it. “Many of us spend our whole lives believing we are the source of our own suffering when we are not,” he said. Wolynn presents his findings in terms of epigenetics, the study of how life experience can turn on or off certain genes. He points to findings in both humans and animals showing that the children of traumatized parents react with stress, fear or aversion to stimulus that traumatized their parents, even if the children themselves have no previous negative exposure to the trigger. “We think the effects – the alteration in the genes – may last for three generations,” he said. 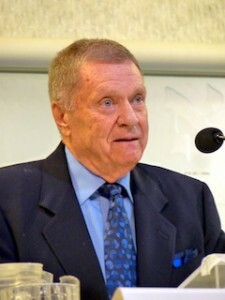 Wolynn described several case studies in which patients had symptoms that could be addressed only after patients understood their source in something that had been done to (or by) a mother or grandfather. Wolynn challenged the audience to ask themselves what their greatest fear was and to put it into words, explaining that this was a clue to their “trauma language,” which could, in turn, be used “like breadcrumbs” to lead them back to the unrecognized traumas in their past. Wolynn laid out a series of steps for uncovering intergenerational traumas and healing the brain. He also shared stories of his use of visualization, ritual and family communication to free both adults and children from chains they didn’t fasten themselves. Stamp said he knows of two people who attended a follow-up training session offered by Wolynn in Vancouver after the public lecture, and who have had success applying Wolynn’s method clinically; one of them being a counselor at JFSA. “It works,” said Stamp. 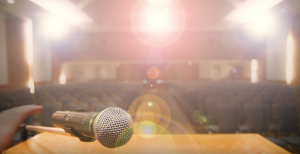 JFSA offers counseling for a wide variety of issues, and Stamp is hoping that attendees at Wolynn’s talk will be inspired to pursue healing, through JFSA or elsewhere. JFSA, the Jewish Seniors Alliance of Greater Vancouver, Congregation Beth Israel and the Vancouver Holocaust Education Centre partnered to bring Wolynn to Vancouver, and the talk was additionally sponsored by the Lutsky families and Rabbi Rokie Bernstein. Banyen Books hosted Wolynn the day after his talk at the synagogue. Sometimes there are jokes about how we’re all emotionally damaged to some degree. 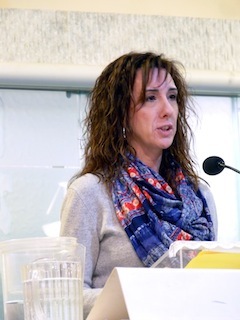 It’s a serious problem for us, because we all lived through wars and terror attacks,” shared Canadian-Israeli Yolanda Papini Pollock of Winnipeg Friends of Israel (WFI) at a lecture co-hosted by WFI on Feb. 9. 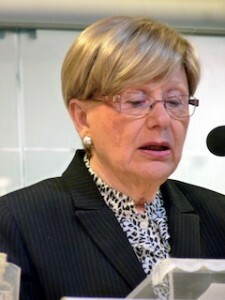 The discussion, which focused on the topic The Psychological Impact of War and Terrorism: Coping with and Minimizing Trauma, was held with the local Canadian Associates of Ben-Gurion University of the Negev chapter, the Jewish Post and News and Congregation Temple Shalom, at the synagogue. “I’ve worked with refugees for the last decade,” said Michel Strain of the Manitoba Immigrant and Refugee Settlement Sector Association. “All have come from countries affected by war and many have experienced trauma and torture, many living in refugee situations for many years. Holocaust survivor Edith Kimelman spoke about dealing with her personal trauma. She was 16 years old when Germany invaded her small community in Poland. “I stood at a neighbor’s window and watched my father being led away by soldiers, only to find him later in a field – dead and riddled with bullets,” she said. “It was beyond my young comprehension to understand that no one in our non-Jewish community of neighbors would help us bring him home. My childish belief was, once he returns to our house, he would return to life. “To watch from our window, as Jewish neighbors were led behind a stable, shot and quickly buried gives me, to this day, nightmares. To find my mother so severely beaten that it led to her death will haunt me forever. I felt like I was punished, having to remain alive without her. Kimelman explained how this trauma has affected every aspect of her life, including, of course, her relationships with family and friends. While she fears she will leave her sons with the heavy baggage of her unfortunate experiences, she is confident that her fierce love for life and her survival will carry them through. The keynote speaker of the event, BGU’s Dr. Solly Dreman, who was born and raised in Winnipeg before moving to Israel 50 years ago, was introduced by Dr. Will Fleisher, a local therapist experienced in working with traumatized youth and adults. Dreman is professor emeritus in BGU’s department of psychology. He differentiated between war and terrorism, explaining that war is usually preceded by prior events and circumstances, while terrorism occurs suddenly, without warning, causing a different type of trauma. Unlike war, terrorism is not confined to a specific geographic arena or time dimension. “The threat persists, the fears, uncertainty, the sense of helplessness,” he said. “Such attacks are looming over our heads all the time. You have the unbridled devils lurking in your soul forever. That’s going to serve as the trigger for anxiety, feelings of helplessness and inability to cope. Dreman pointed to the media as an aggravator in Israel, saying they continually expose the public to the horrific events, while frequently providing information that is unreliable and unconfirmed. He also said the general public, too, is responsible for watching, reading and listening to these reports more critically. He spoke about his experiences with two separate terror incidents. “Our initial therapeutic attempts were designed to deal with interpersonal things, like helping teachers in their contact with the young victim students, helping integrate them into the school system,” said Dreman. The approach seemed to have worked for the first few years, but when Dreman went back to these families 10 years after the initial contact, he found them struggling with life and their interpersonal relationships. Dreman suggested that limiting media exposure may be helpful, as the constant repetition of the horror does not allow people to heal. But, on the other hand, he said it is important to not go completely off the grid, as that can cause anxiety to a breaking point that might create more trauma. A balance is needed, he said. Dreman further advised that it is important to embrace life, that social support is a major factor in healthy adjustment. “Be up front with your kids, explaining that you will do your best to protect everyone,” he said, “but don’t promise that nothing bad will happen, as that is a promise you may not be able to keep. We should allow kids the opportunity to express their fears, but not to dwell on them, as that will exacerbate the sense of trauma. At the end of last year, 75 families from southern Israel received specialized art therapy kits, thanks to a new project organized by United Hatzalah of Israel’s Team Daniel initiative. In conjunction with Artists 4 Israel, the art therapy kits were distributed Dec. 8-10, along with a program showing parents how to use the kits with their children and visits by graffiti artists who worked with teens to paint neighborhood bomb shelters. Various art therapists also participated in the events. Last summer, during Operation Protective Edge, a group of Chicagoans was touring the Eshkol region as sirens blared. These community members were so moved by their experience and, after hearing about the death of 4-year-old Daniel Tragerman, decided to raise money to help the region. Some 50 Chicago families established Team Daniel to fund the training, placement and equipment needed for 100 United Hatzalah medics to service southern Israel. The new kits are given directly to the families of these volunteers, who often run out on a moment’s notice to attend to rocket attacks and other local emergencies. The arts kit was developed by experts from Israel and the United States in the mental health field in collaboration with the nonprofit Artists 4 Israel. It is hoped that the “first aid kit for young minds” will combat the effects of trauma and eliminate the chances of PTSD by up to 80% through self-directed, creative play therapies. United Hatzalah, a community-based emergency medical response organization, has been distributing the kits in a pilot program throughout Israel since July. 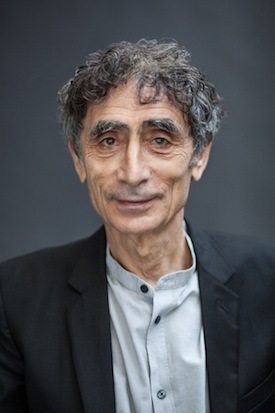 A screenshot of Dr. Gabor Maté and Rita Bozi in The Damage is Done, from video by Patrick McLaughlin. The Cultch often presents non-traditional shows that confront uncomfortable questions. This year, one such show, The Damage is Done by Rita Bozi, brings to the stage an examination of trauma and its psychological impact on individuals and families. The Damage is Done combines theatre, dialogue, essay, video, music and dance. It features two performers: Bozi, and physician and author Dr. Gabor Maté, who has written on various psychological issues, including addiction. Bozi plays several characters in the show, while Maté plays himself. So, many professionals turn to Maté. His seminars are in such demand across North America that sometimes he spends days on the road. “In the last week, I had eight speaking engagements,” he said. In various American and Canadian cities, addiction workers, trauma specialists, therapists and educators, as well as family members and others, comprise Maté’s audience. Bozi also spoke with the Independent. She explained that the show was years in development. Its most recent version premièred in Yukon last year. “This show is ultimately about compassions for ourselves and others,” she said. According to Bozi and Maté, healing comes from the ability to look at traumatic events from infancy and early childhood with humor and compassion – even though the damage is done, we can defuse its impact. The Damage is Done will be performed at the Cultch from Oct. 20-24. Before that, Bozi and Maté are taking the show to Banff, where both their evening shows are already sold out. For more information about the local production, visit thecultch.com/events/the-damage-is-done-a-true-story.